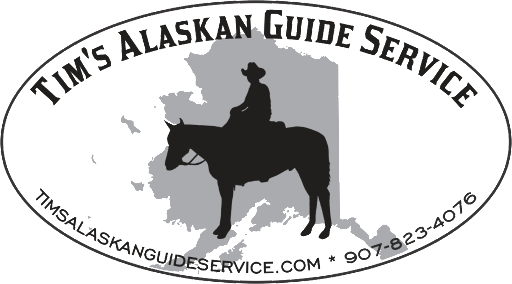 An exciting year for Tim’s Alaskan Guide Service! As some of you may already know last January I purchased Alaska’s Backcountry Unlimited from Mike McCann and will be taking over his area in the Brooks range providing horseback Dall sheep, Grizzly, and Moose hunts. I plan to operate under the same ethics and conservation tactics that Mike has set into place over the last 28 years in order to provide my clients with the highest quality hunts that this game rich region has to offer. I have enjoyed working with Mike over the last 17 years and have a great appreciation for his wilderness skills and knowledge of the area. Base camp will not be the same without his good advice, great stories, and endless jokes. 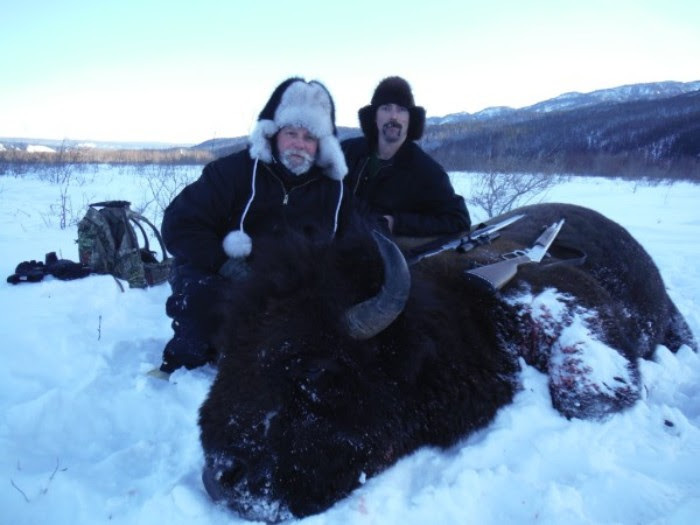 My first hunt this year was with Howard Rixie who was lucky enough to draw a Copper river bison tag. Howard chose to come hunt in February and was rewarded with a huge bull on the first day of the hunt! Howard Rixie with a large bull taken on a sunny -10 F afternoon in February. 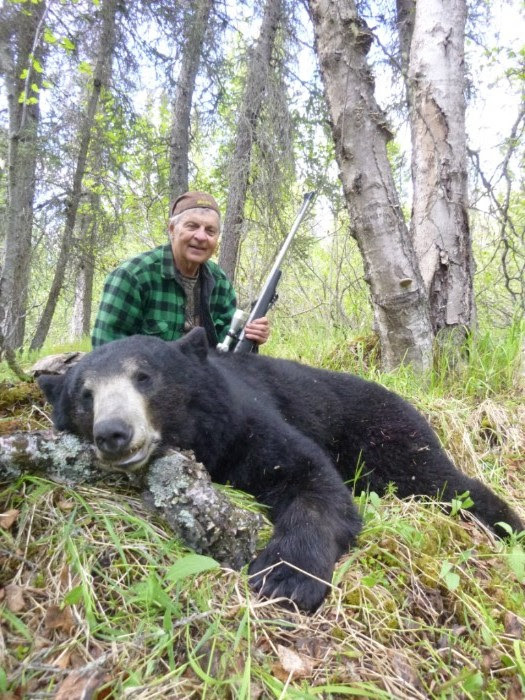 Our spring bear season began May 16th with Rick Stauffer from Billings, MT. who had been on three successful hunts with me in the past. Rick and I have gotten to know each other pretty well over the years and it was good to get a chance to catch up with him again. 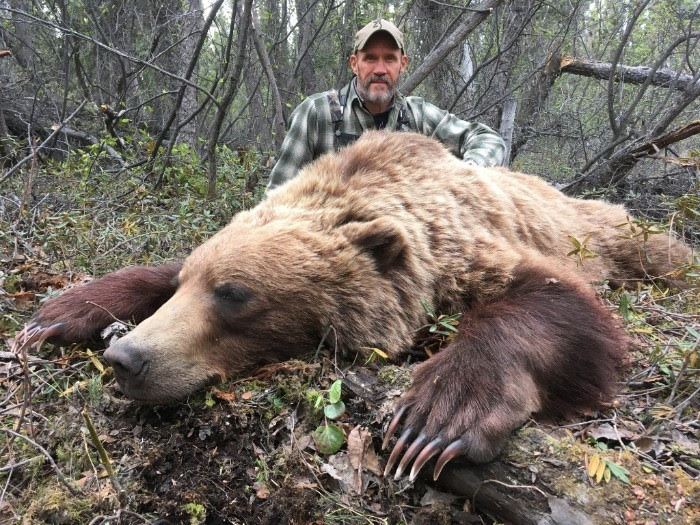 This year Rick finally harvested the grizzly that he has always wanted! Next up was Kent Price from Culver, KS. Kent is another familiar face as he hunted with us in the Brooks Range the previous year. Kent took home our biggest black bear of the season, a huge cinnamon killed on the first day of the hunt! 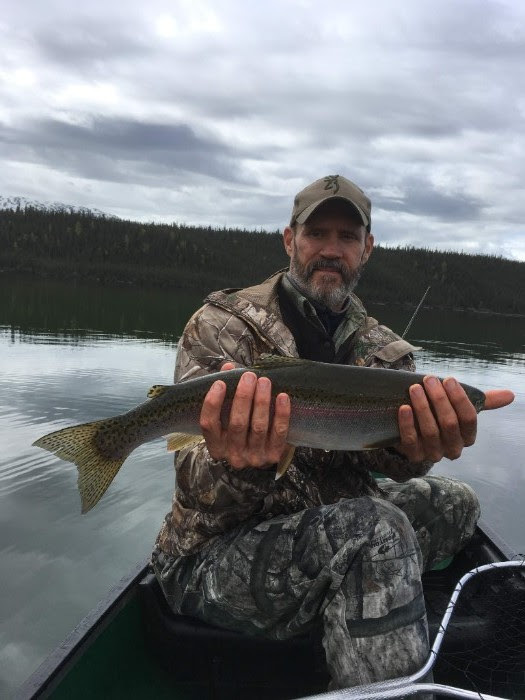 Kent was also able to get a grizzly on the second day and had time to do some trout fishing in one of the nearby lakes. On the last hunt were Jim Doyle and good friend Brian Dziesinski. 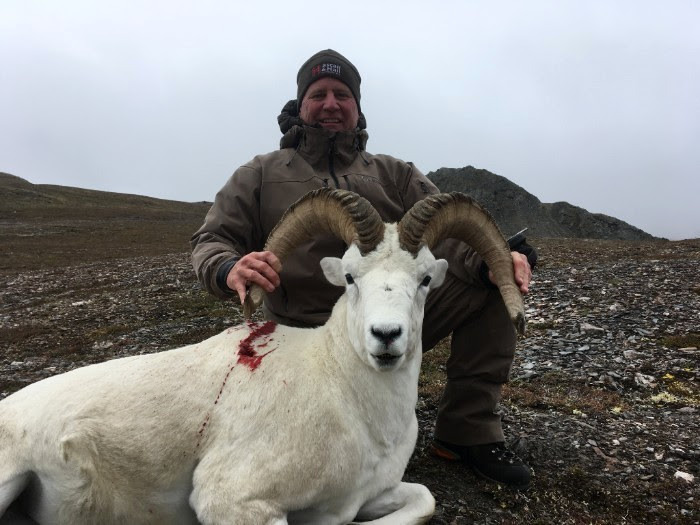 Jim has hunted with me twice in the Brooks range, the first time taking a grizzly and last year an exceptional Dall sheep. This time Jim was guided by my brother Shane Nelson while I guided Brian. We all hunted hard, saw several bears, and both Jim and Brian took home a nice trophy black bear. Our spring bear hunts are cabin based hunts. Due to the thick timber and brush in this area we hunt over bait. This gives us time to judge the quality of the trophy and allows for good shot placement. ATVs are used to access the bait sites. I still have spring hunts available for 2019. Call or email now to reserve your hunt or go to: http://timsalaskanguideservice.com for more info. 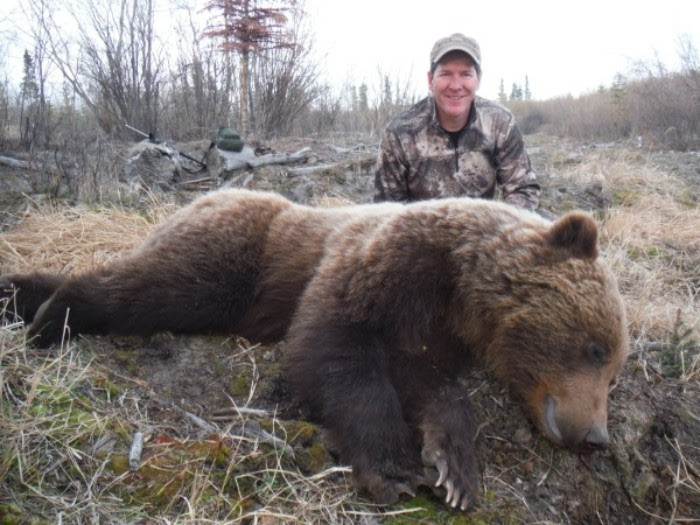 Rick Stauffer with his well earned grizzly. Jim Doyle shows off a big boar with unique face color and pattern. 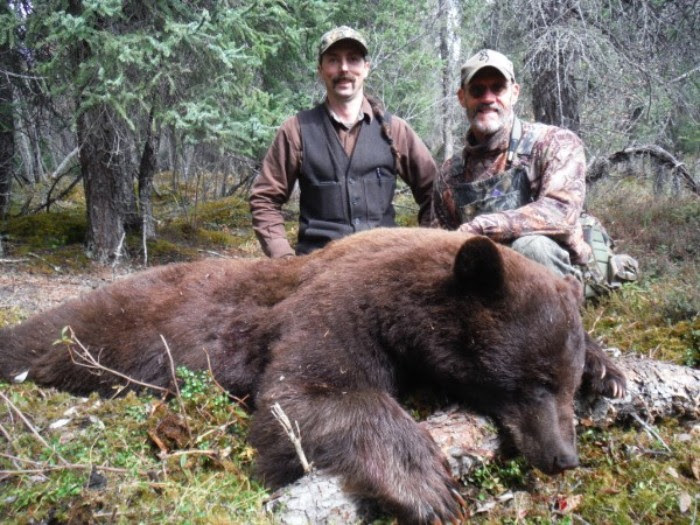 Tim Nelson and Kent Price with a huge cinnamon black bear. 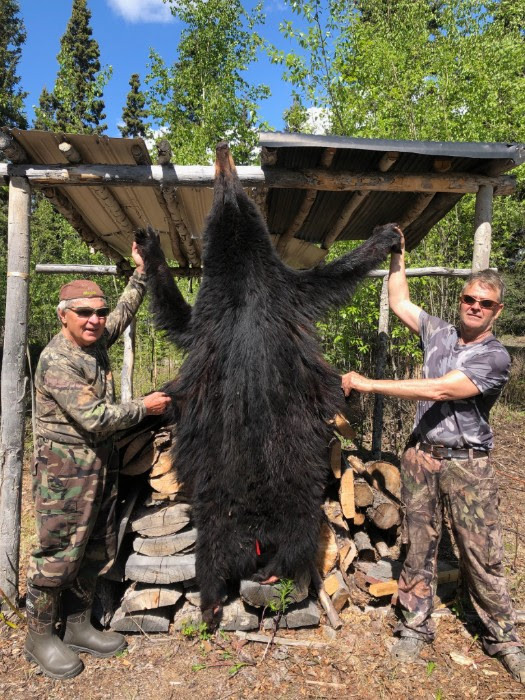 Jim Doyle and Brian Dziesinski with Brian’s black bear. Kent price poses with a beautiful light blonde grizzly. Kent Price admires one of the rainbow trout he caught after the hunt. This year was a transitional year between Mike and I and as a result we did not have as many clients in camp as usual. 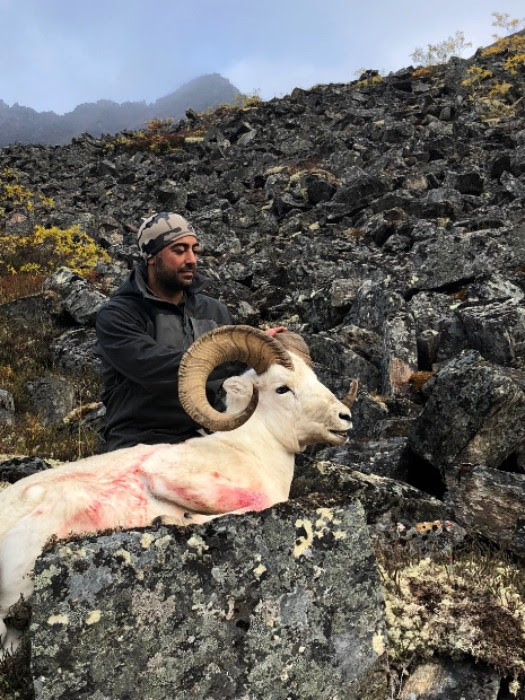 The Dall Sheep population in our area continues to be healthy and I am predicting that next year will be a very productive season for us. Our first hunt this fall began with Rob Bergeron from Portland, ME, Jeff Carlton of Fort Collins, CO, and John Day from Indian Springs, AL. After several days Rob guided by myself and John guided by Shane Nelson both came back to Basecamp with nice rams. Jeff hunted hard, saw some big rams, and had a couple of opportunities but unfortunately was not able to get a ram. On the second hunt were Robert Josey from Austin, TX, Mohaned Al-Humadi from Olean, NY, and Kent Price from Culver, KS joined us again. After seeing several good rams, Mo (guided by Adam Beam) and Kent (guided by Shane Nelson) both harvested big rams on the 9th day of the hunt! Robert and I spotted the most impressive band of rams that I have seen in years. We stalked them three times, once to within 40 yards, but were never able to get a shot. Those old boys are still out there and will only be bigger next year. Our only sheep/grizzly combo hunter for the 3rd hunt was David Rook who was unable to hunt due to a back injury he obtained a few weeks prior to the trip. The last hunter of the season was Gary Dawson from Kentucky. Gary’s brother Bill was also along as an observer/photographer. We began by camping up high and looking for a big ram that I saw previously but were forced to come down out of the high country early due to poor weather. We focused on moose for the second half of the hunt and saw several big bulls but were never able to get close enough for a shot. Gary and Bill were great guys to have in camp and we hope to see them again soon. Our moose population is the highest it has been in years. I would highly recommend braving the cooler weather and joining us for a late season multispecies hunt. Rob Bergeron and his 9 year old broomer. John Day with a wide horned ram. 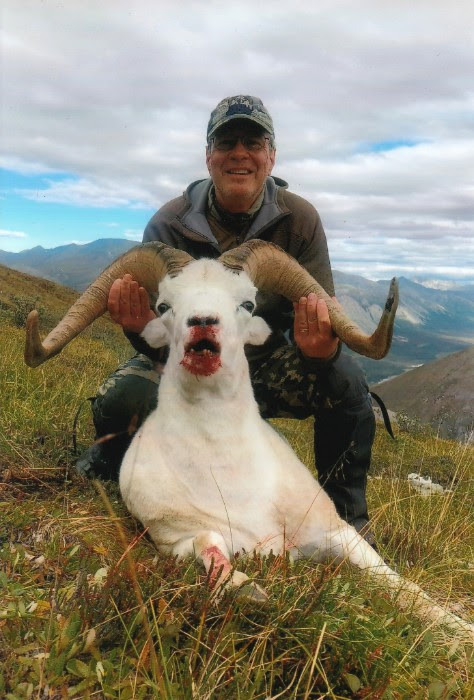 Kent Price with his trophy Dall sheep. Mo admires his heavy horned 38″ ram. Special thanks to my crew and everyone who helped make this such a great season! Click here to sign up for future newsletters and special offers! 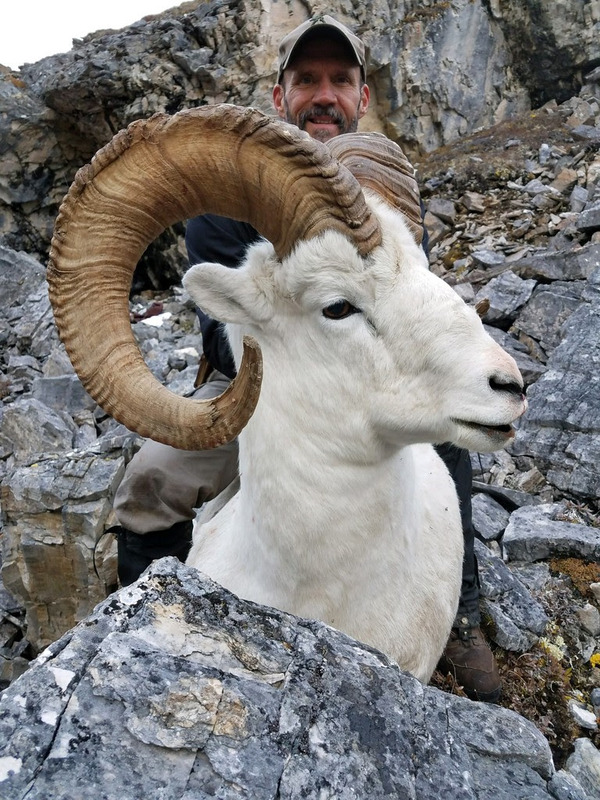 “Tim was my guide for my 2012 Dall Sheep hunt in the Brooks Range of Alaska. I really couldn’t have asked for a better guide/hunting partner - Tim is an excellent guide whose slow and deliberate style of moving, hunting, and always having his nose stuck behind a set of good binoculars matched my hunting style to a T. Like it should have been, I had not only had a guide but made a friend I will always keep in contact with. With Tim starting his own outfitting business he will be at the top of my list for any future Alaskan adventures!! Norm DeCastro – Casper, WY and Olathe, KS.